I’ll share a personal experience here and then see if I can’t raise it to a principle of IVR. I have a gold-level account at my bank. That gets me some extra services, free this and no-fee that. Most of the time I bank through online and mobile channels. But when I do call in to the Gold Account number, after authentication I’m taken directly to a live agent—no IVR questions asked. Their IVR is capturing all my moves across channels. They know I deposit, transfer, and make payments across web and mobile. They see that only when checks exceed the online deposit limit do I go to a branch . . . and then I’m using the ATM not the teller window. And they know that I rarely call in. Seeing my apparent preference not to talk to someone, the IVR makes a decision that if I’m calling in, it’s likely that I want an agent. They don’t believe in their own IVR. The other explanation is that the bank assumes that a “gold” customer would never want to have an automated interaction. That providing “best-of-class” service means always connecting me directly to a rep. In the first scenario, my bank is doing things exactly right. It’s gauging my actions and making decisions because of it. And they would be right: I only call in to talk with an agent. But I’m not sure that it isn’t the second scenario that’s in play here. Does that second scenario apply to you? Are you still viewing the IVR as a sometimes necessary evil whose real purpose in life is to save you money on call centers? And friends never let friends Press 1 for Balance? The notion that nobody wants to use the automated system is proven in study after study to be false. Often, depending on the person and the call intent, IVR interaction is exactly what the caller wants. A Super Duper Double Platinum customer isn’t any less likely to want to use automated systems if it completes his call task the most quickly and efficiently. And, with its response tables properly configured, the IVR can present a very personal and targeted greeting to every customer: including premier ones. Hello Mr. Williams and thank you for being a Mega Titanium customer for 5 years. If you’ll enter your PIN I’ll start to help you right away. Of course, the IVR can also say “if you want to speak to a representative at any time . . . .“ and you want to offer that more quickly to your best customers than you do to your average customers. But it’s a mistake—and it goes against all the research—to think that they just don’t want to use an IVR. So the principle is this. People don’t hate IVRs. They just hate lousy ones. Use the tools and reconfigurability options of your IVR to present customized, personalized, relevant options and messages. Connected to your databases, your IVR can make every caller feel special. 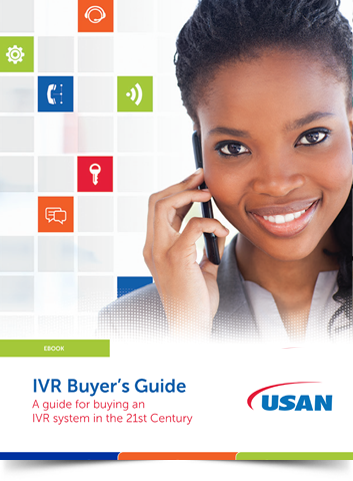 Download the IVR Buyers Guide Today!